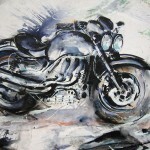 Motor Cycles painted in acrylic . 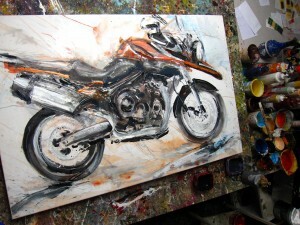 . . today in my atelier is spontan painting in acrylic . . . very spontan with high speed on motor cycles . . . fort biker fans and also fast driving women . . . 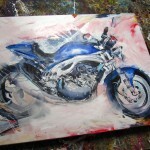 I paint this big machines while hearing the sound of Depeche Mode . 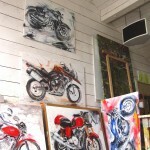 . . some biker likes to have a spontan-painting like this in his living room? . . .